The art-deco style Revere Ware tea kettle (stainless steel body, copper bottom, and Bakelite handles) is an iconic part of the Revere Ware line and has been around since the early days of Revere Ware; the earliest evidence we have is from an ad from 1949 that shows the tea kettle as part of the Revere Ware line. Revere Ware (aka World Kitchen) still produces tea kettles that are much the same as they were back in the vintage days. This is one piece we feel is worth buying new as the quality isn’t much different than it used to be. They may not last quite as long (leaking between the stainless body and copper bottom occurs sometimes) but they aren’t expensive at just over $20. The main difference is appears to be the thickness of material used. Because you are only heating water in a kettle, the thickness of the copper bottom doesn’t matter that much; the copper is more decorative than useful. All Revere cookware can be used on gas and electric coil ranges. Tri-Ply / Encapsulated cookware can also be used on most smooth-top ranges. Consult the owner’s manual of your range for recommended cookware. Because most people leave their kettles on the stove, it is very common for them to pick up grease splatter from everyday cooking. The grease gets cooked on as you repeatedly heat the kettle and can be hard to get off. The first thing to try is Bar Keepers Friend, which is very good at removing baked on grease. If this doesn’t work, fill the pan with water and bring to a boil. While the pan is still hot, apply some copper polish or Bar Keepers Friend to the grease stains and scrub them. If you can do this while leaving the water in the pan, pot, or tea kettle, you will get better results. If you can’t, work the grease stains quickly while the pan is hot and repeat the process until the stains are gone. The heat loosens the grease and allows it to come off with very little work. This is a very common occurrence with a simple remedy. To clean simply combine equal amounts of vinegar and water in the tea kettle and simmer for 10 minutes or so until the hard water deposits flake off. You may need to repeat this treatment. You can also try simply filling your kettle with a 50/50 vinegar/water mixture and letting it stand overnight. We sell replacement caps and triggers, and handles, for the 2 1/3 quart kettles. The caps will fit the larger 3 quart kettles as well (we are told by customers). 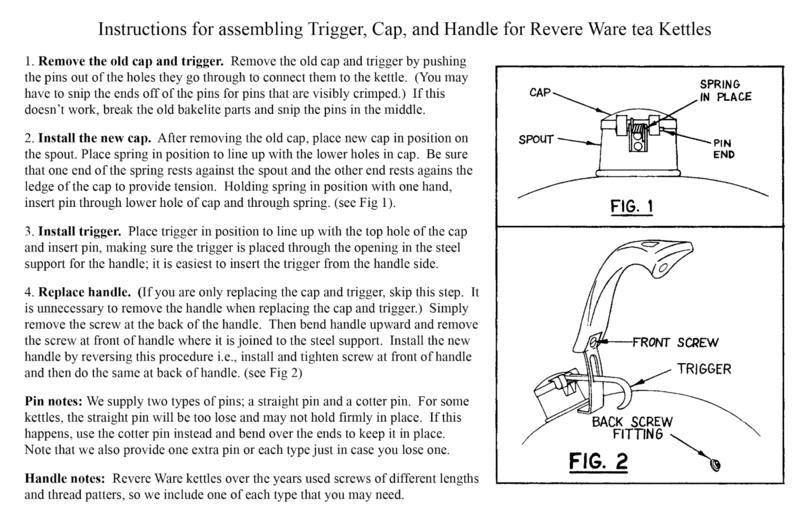 Here are the installation instructions for the new cap & trigger. 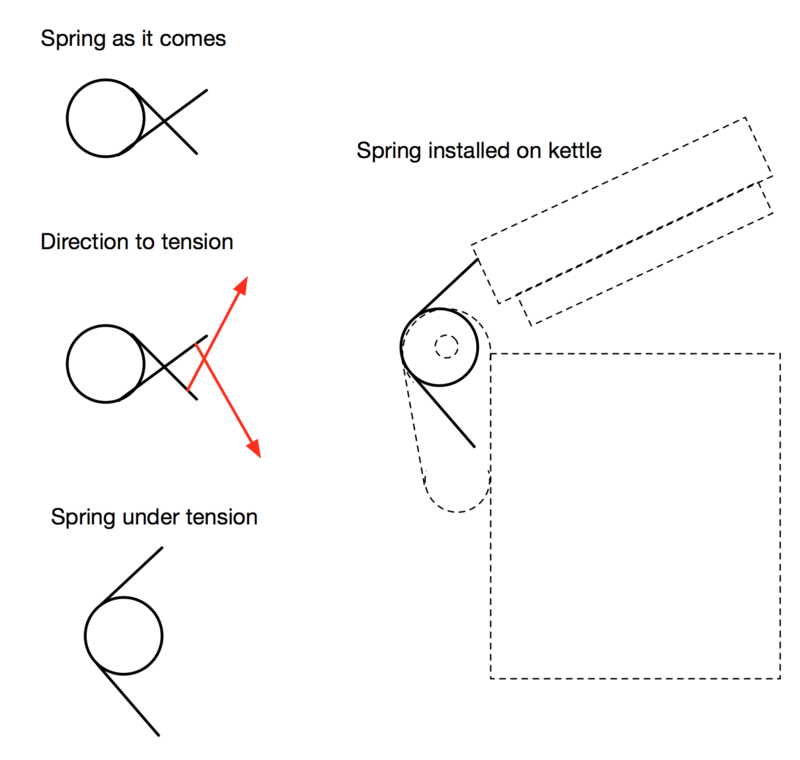 If you are having trouble with the spring, here is a graphic that may help.